Luxueux Golfe-Front Condo, prêt de vélos gratuit / Wifi, TV écran plat! Shell Island Beach Club est une belle communauté située devant le golfe, près du célèbre phare de Sanibel! L'établissement propose 2 piscines chauffées, un bain à remous, un sauna, un tennis, un jeu de palets, des vélos gratuits et une connexion Wi-Fi. Shell Island Beach Club 7C est idéalement situé sur le coin est du dernier étage et offre une vue imprenable sur le golfe sous presque tous les angles! Le positionnement du 7C crée une sensation d'espace et de luminosité grâce aux plafonds voûtés et aux fenêtres latérales supplémentaires. Cette unité joliment rénovée dispose d’un lit king-size dans la chambre principale, de 2 lits jumeaux dans la chambre d’invités et d’un canapé-lit dans le salon..
Lovely beach and pool, apartment is basic but very comfortable, beautiful ocean view from screened porch. Convenient location and nice facilities at beach and pool (umbrellas, towels, chairs, lots of beach toys, showers etc) Definitely would return. boardwalk is a perfect entry onto the white sand beach. Our unit, 7C was perfectly fine - incredible views, very clean and welcoming. We had no problems with appliances, etc. ; and the key cards worked perfectly every time! (This does not always happen.) 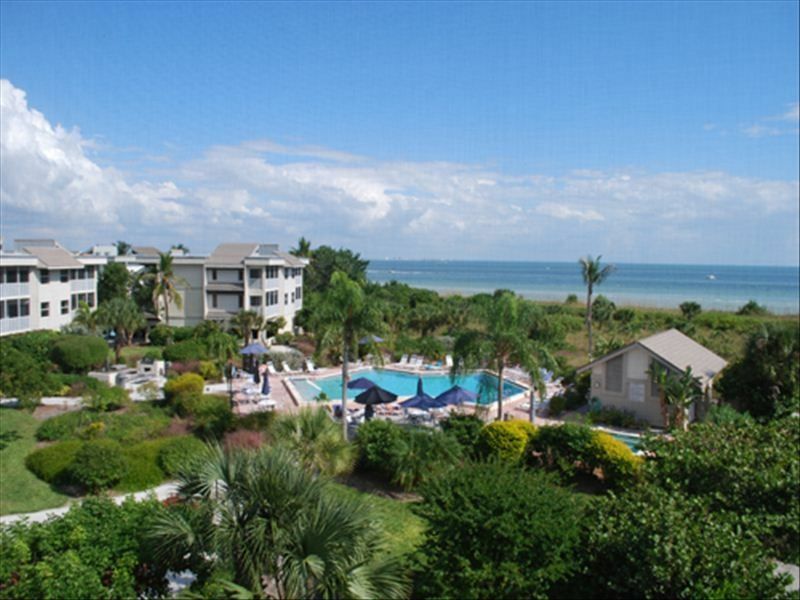 The ambience of the overal property is relaxing and classic Floridian, which we love. The staff at Sanibel Holiday could not have been nicer to us, and we appreciated their warmth and enthusiasm. We loved our stay on Sanibel and our condo was great! It was well equipped for cooking and we loved the convenience to the ocean and being able to use the bikes and the pool area. We would love to come again! The view from the condo is beyond words. I could have sat on the lanai all day, but the white beaches right out the door were calling. Beautiful shells were everywhere. The condo itself was lovely and decorated with good taste. The beds and sofas were very comfortable. The linens, sheets and towels, were top notch. The kitchen had everything we needed and we cooked a lot. I love this end of the island because it is not as crowded. Also, to be able to walk to the lighthouse and pier in a short time was a treat. The pool was heated and there were free bikes. Sanibel has too many wonderful restaurants. We tried The Lighthouse Cafe and Gramma Dot’s, both close by the condo. We also ate at Doc Ford’s, Cip’s, and Sweet Melissa’s all very good. We so enjoyed the Ding Darling Wildlife Reserve seeing so many birds like the roseate spoonbills. We took in the Sanibel History Museum and learned about early Sanibel, very interesting. A week is not long enough to enjoy this condo and paradise. Condo was clean, quiet and wonderfully located. Check in was easy and everyone was friendly. The grounds, pool, shuffle board and hot tub were great. We had a minor plumbing issue and plumber was out and fixed the problem quickly. Grand kids loved the bikes and since my family shells and fishes all day the location was perfect. We only used the car a few times as we could load the wagon and walk or bike to the fishing pier and light house beach. The unit was a nice size and we enjoyed the large screened in porch for eating, shell sorting and evening family board games. Beautiful condo. Lovely view. Had.a great time! Hated the red tide. Wonderful property! Owners are thoughtful in staffing with shelling items, games and videos. Pool was refreshing and nice size. Bikes were a plus! Hot tub was relaxing. Best feature was the lanai on our unit. The views were lovely.